At its completion, the Thomas Viaduct was the largest railroad bridge in the United States  and the country's first multi-span masonry railroad bridge to be built on a curve. It remains the world's oldest multiple arched stone railroad bridge. In 1964, it was designated as a National Historic Landmark. The viaduct is now owned and operated by CSX Transportation and still in use today, making it one of the oldest railroad bridges still in service. The viaduct was built by John McCartney of Ohio, who received the contract after completing the Patterson Viaduct. Caspar Wever, the railroad's chief of construction, supervised the work. The span of the viaduct is 612 feet (187 m) long; the individual arches are roughly 58 feet (18 m) in span, with a height of 59 feet (18 m) from the water level to the base of the rail. The width at the top of the spandrel wall copings is 26 feet 4 inches (8 m). The bridge is constructed using a rough-dressed Maryland granite ashlar from Patapsco River quarries, known as Woodstock granite. A wooden-floored walkway built for pedestrian and railway employee use is four feet wide and supported by cast iron brackets and edged with ornamental cast iron railings. The viaduct contains 24,476 cubic yards (18,713 m3) of masonry and cost $142,236.51, equal to $3,454,512 today. When the Thomas Viaduct was completed, a 15-foot (5 m) obelisk with the names of the builder, directors of the railroad, the architect (engineer) and others associated with the viaduct was erected at the east end in Relay, by builder John McCartney. On one side the monument reads: The Thomas Viaduct, Commenced July 4, 1833 Finished, July 4, 1835. He also celebrated the completed work by having his men kneel on the deck of the viaduct while mock " baptizing" them with a pint of whiskey. Until after the American Civil War, the B&O was the only railroad into Washington, D.C., thus the Thomas Viaduct was essential for supply trains to reach the capital of the Union during that conflict. To prevent sabotage, the bridge was heavily guarded by Union troops stationed along its length. In 1929, extensive mortar work on the masonry was carried out, and again in 1937. To counteract deterioration of the masonry, the Thomas Viaduct underwent more cosmetic upgrades in 1938 performed by the B&O Maintenance of Way Department. The work consisted primarily to improve facilities for drainage, relocation of loose arch ring stones and the application of a grout mixture to the stone spandrels filling. Nevertheless, the bridge is still indicative of the way in which the B&O track and major structures were put down in the most permanent manner possible. At an unknown date, railing blocks were removed from the north side of the deck and a bracketed walkway added giving more lateral clearance. Little work had been done on the viaduct until the repairs of 1937–1938 which, according to a 1949 report by the Chief Engineer of the B&O, would keep future maintenance to a minimum. From the 1880s to the 1950s, Thomas Viaduct carried B&O's famed Royal Blue Line passenger trains between New York and Washington. Until the late 1960s, the bridge also carried B&O passenger trains traveling to points west of Washington, such as the Capital Limited to Chicago and the National Limited to St. Louis. With the advent of Amtrak on May 1, 1971, B&O ended its passenger train service, except for local Baltimore–Washington commuter trains. In 1986, CSX acquired the B&O and all of its trackage, including the Thomas Viaduct. Today, MARC's "Camden Line" train service runs daily trains over the Viaduct. See Capital Subdivision. During design and construction, the Thomas Viaduct was nicknamed "Latrobe's Folly" after the designer Benjamin Latrobe II, because at the time many doubted that it could even support its own weight. Contrary to these predictions, the Thomas Viaduct survived the great flood of 1868 as well as Hurricane Agnes in 1972, two floods that wiped out the Patapsco Valley and destroyed nearly everything in their path; and to this day it continues to carry 300- ton (270 tonne) diesel locomotives passengers and heavy freight traffic. The bridge was designated a National Historic Landmark on January 28, 1964,  and administratively listed on the National Register of Historic Places on October 15, 1966. The bridge has also been named a National Historic Civil Engineering Landmark by the American Society of Civil Engineers. This illustration appears in a book printed in 1835, the year the viaduct opened. Patterson Viaduct - one of John McCartney's earlier works. Bloede dam - a historical hydroelectric dam located within the same park as the Thomas Viaduct. ^ a b Yearby, Jean P. (1984). "Baltimore & Ohio Railroad, Thomas Viaduct" (PDF). Historic American Engineering Record. Washington, D.C.: Library of Congress. Retrieved April 27, 2014. ^ Howard County Historical Society. Images of America, Howard County. p. 17. ^ Maryland Department of Natural Resources Patapsco Valley State Park. 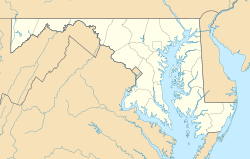 "Patapsco Valley State Park History". Archived from the original on August 9, 2007. Retrieved October 3, 2007. ^ U.S. Office of Archaeology and Historic Preservation. The National Register of Historic Places, vol, 1, p. 193. (Washington: Government Printing Office, 1972). ^ Park, John R (2002). Maryland mining heritage guide: including Delaware and the District of Columbia. Miami, FL: Stonerose Pub. Co. pp. 32–33. ISBN 0970669720. ^ Howard County Historical Society. Images of America Howard County. p. 116. ^ Laura Rice. Maryland History In Prints 1743-1900. p. 81. ^ "Top 10 endangered historical sites in Howard County". The Baltimore Sun. 11 July 2014. ^ Amanda Yeager (26 May 2015). "Former school tops Howard County's endangered sites list". The Baltimore Sun. Wikimedia Commons has media related to Thomas Viaduct. Rasmussen, Frederick N. "Thomas Viaduct celebrates its 175th anniversary in July," The Baltimore Sun, Saturday, June 19, 2010.